We had an unofficial Chocolate Day at daycare. It all started with the littlest mini declaring she wanted to "make our own candy. Like, in the kitchen." 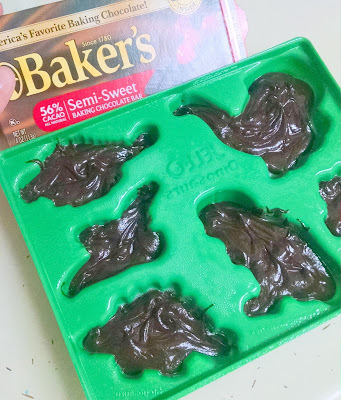 I really wasn't up for attempting to make candies with a gaggle of littles around, but I knew I could easily do melted chocolate candy shapes. We've melted chocolate for a few different activities at daycare (including chocolate covered strawberries during Valentine's) so I knew it was safe and the kids enjoyed it. My first thought was to break out the 100+ cookie cutters we have and let the kids choose what shape they wanted their chocolate to be in. As I went to pull the bin of cookie cutters out I came across our bin of Jello mold. Duh, that would be much easier and I wouldn't have to deal with indecisive children (when I came to picking out their shape). 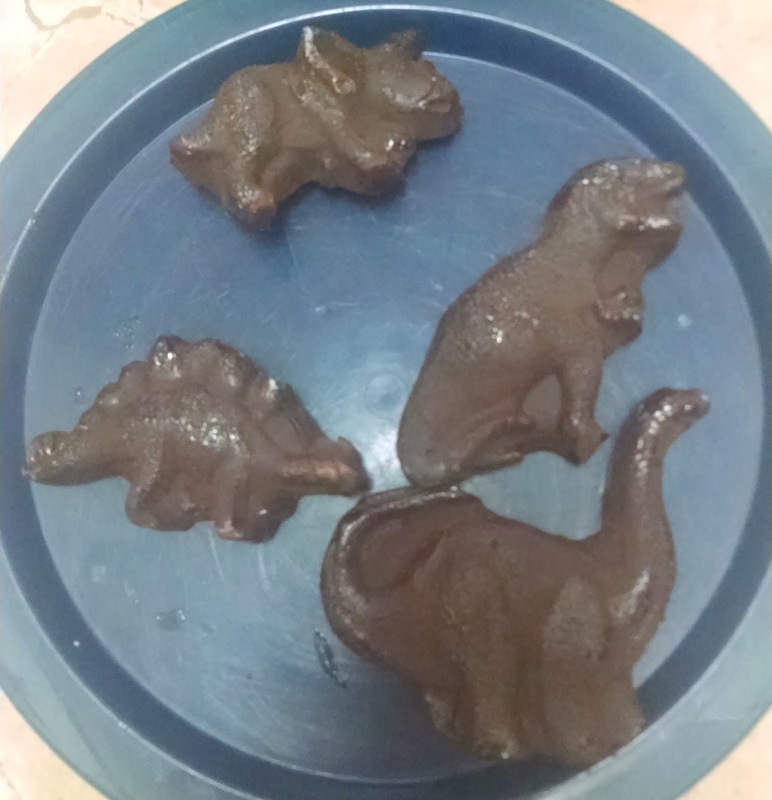 I picked out our dinosaur molds and also the 4th of July mold for a couple of extra. First, we started with two boxes of Baker's semi-sweet chocolate and a bit of milk. Following package directions, we melted the chocolate in the microwave (this is easiest to do with small children around, but be careful of the bowl as it can get very hot). As the chocolate melted, I sprayed the Jello molds with cooking spray. This made the chocolate slip out easily after they were cooled. Once the chocolate was melted, I let the kids help spoon the chocolate into each mold. The hardest part was making sure chocolate got into each crevice and wasn't too thick (I wanted it thin for little teeth to bite into easily). Once all of the molds were filled, we put the chocolate in the refrigerator to harden. This took a couple of hours. Then we popped them out, put them on a plate and enjoyed! The kids loved helping to make their treat and seeing how the chocolates were made. Next time we may attempt to make our own chocolate (using this recipe). Another fun addition to the activity was reading Curious George Goes To A Chocolate Factory. We read it while the kids ate their chocolate dinosaurs. If you're able, visit your local (or closest) chocolate factory/store to let the kids see how everything in made, how the equipment runs, and of course, taste test the different kinds of chocolate.